2 or more @ £23.25 per unit (see above). 3 or more @ £22.50 per unit (see above). 4 or more @ £21.75 per unit (see above). 5 or more @ £21.75 per unit (see above). 10 or more @ £19.50 per unit (see above). Please be advised that additional charges may apply to your order for bubble wrap of sizes 1000/1200/1500mm. Bubble Wrap in these sizes have to be shipped with a particular courier only. There are certain restrictions regarding shipment of these which are listed below, depending on the area that you live and if you are a Private/Residential address. 1. 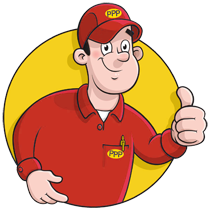 Residential Delivery Address - Private / Residential Address includes companies or persons working from home with no business rates. Some allowances can be made ( subject to enquiry ) for Private/Residential properties which are located on busy High Streets, where Retail Business activities might take place.